Check Point Cloud-Managed Security Service offers small businesses a proven and cost-effective security in a simple All-in-One solution. 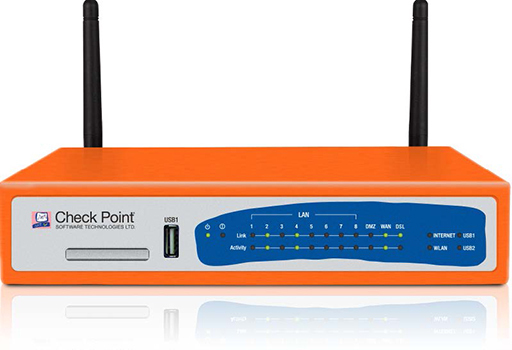 The 620 Wireless appliance (recommended for up to 10 users); combined with our security experts available 24x7, ensure full network protection. Threat Prevention Security Services including IPS, Application Control, URL Filtering, Antivirus and Anti-Spam. Protection against the onslaught of security threats has never been more important to the well-being and the mere survival of today's businesses. The good news is that security companies are constantly improving their technologies to stay one-step ahead of the evolving threats and to offer protection for their customers. Businesses spend millions of dollars each year to build up defenses around their network, data and IT infrastructures. However, this constant cat-and-mouse game can be especially challenging for small businesses with limited resources and IT/security expertise. Growing complexity-The advancement in today's IT technologies offers businesses higher efficiency, better flexibility and more choices. But unfortunately, it also opens up more doors for potential attacks such as viruses, email exploits, identity thefts, confidential information loss, etc. A serious network security breach can potentially have a major financial impact on a company, or devastate a business' reputation. Lack of security expertise-Cyber criminals are well versed in IT technologies and look for easy targets to conduct their criminal acts. Combating the evolving security threats requires a high level of security experience and expertise. It is only with the right level of security expertise and tools, that one can even the playing field with those well-equipped cyber criminals. Limited resources-fighting effectively against today's security threats requires the best security tools available. This can be challenging for businesses with limited resources. In addition, the requirement to provide ongoing updates and support to your IT security infrastructure can put further strain on an already stressed budget. Check Point is the security industry leader and the largest security solution provider focused 100% on providing the best security technologies. Our award-winning solutions are deployed worldwide protecting thousands of businesses. Manage your security so you can focus on growing your business. The Check Point Cloud-Managed Security Services offer you enterprise-class security in a simple all-in-one solution. Let us help you manage your security, so you can focus on growing your business. Best-in-class security-Check Point offers the best security solution available. It is developed by our team of experienced security experts and battle-tested in thousands of deployments. Check Point's customers include tens of thousands of organizations of all sizes, ranging from small businesses to the largest of Fortune and Global 100 companies. Simple all-in-one solution-The fight against complex and malicious threats has just beenmade simple with Check Point Cloud-Managed Security Services. You can deploy and activate the well-thought-out solution packages in two easy steps, then, let Check Point security experts manage it for you through the cloud. You simply set it and forget it. Attractive pricing-Starting as low as $30 per month, the solution is not only effective, but also affordable. With all ongoing support and updates included, this makes your network and data security expensesmore predictable. You now can manage your budget more effectively and plan your precious resources to promote growth for your business. No one understands security better than Check Point. That is why the Check Point Cloud-Managed Security Services can provide unparalleled protection for your network assets. The service has a highly scalable and configurable structure - whether you have a single location with a few employees or multiple locations with hundreds of employees, you are covered. Your security services will be managed 24x7 by our security experts via our Security Management Portal (SMP). Download the Check Point Cloud Managed Security Service Datasheet (PDF). Managed Cloud Service includes a 600 Security Appliance, Next Generation Security Services including IPS, Application Control, URL Filtering, Antivirus, and Anti-Spam Security Services, Software Updated services, Logging & Reporting Capabilities, Expert Management of your network security, and 24x7 Customer Support Services. All 620 appliances include Firewall, VPN, Advanced Network & Clustering blades, Identity Awareness and Mobile Access (for 5 users) blades. The software license for the 600 appliance is generated based on the system s unique MAC address (not the IP address assigned to the system). Recommended for up to 10 users with all Next Generation Threat Prevention blades enabled. On site RMA services are not available on all 600 appliance.